If you love spending time outside whenever the sun is out, consider investing in quality aluminium garden furniture. By doing so you will have a gorgeous yet comfortable place where you can sit and soak up the sun, or have an area to enjoy dinners with family and friends in the glorious sunny weather. Our cast aluminium garden furniture is built to be long lasting. You don"t have to worry about the weather - our quality garden furniture can withstand harsh conditions and can be left outside all year round. The popularity of our quality garden furniture lies in its versatility. It is available in a variety of styles, from romantic to modern. Flowery motifs, intricate patterns and neutral colours make it perfect for just about any garden. 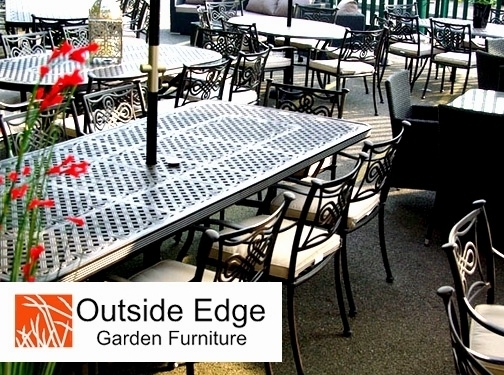 Aluminium garden furniture is lauded for its durability. The sand cast aluminium, unlike wrought iron, is resistant to rust and extremely durable. Each and every item made from this material is sturdy but light enough to be carried around the garden. You also don"t need to varnish or stain aluminium garden furniture every year. All that is required is occasional cleaning with soapy water. Elegant and sleek, our quality cast aluminium garden furniture will be the perfect addition to your garden. Multiple seater sets are a great choice for garden parties- with 6, 8, or 10+ seater sets, you can ensure that there will be room for everyone! 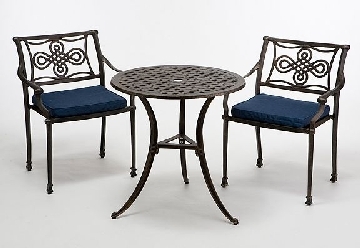 Our gorgeous cast aluminium garden furniture sets can add charm and timeless elegance to your garden. Put away those unreliable plastic chairs and enjoy high quality aluminium tables, chairs and benches with our garden furniture sets! You don"t have to spend a fortune to get your hands on quality garden furniture, as our fabulous aluminium furniture sets are available at affordable prices. Our furniture will remain stylish for many years to come, making garden furniture from Outside Edge a fantastic long term investment. UK (Galleywood, Essex) based business providing cast aluminium garden furniture. Website includes e-commerce facilities, terms and conditions, delivery and returns information, work examples, numerous testimonials, details of business premises (including photos), blog, full contact details including company registration and VAT numbers.